Chris Goldstein poses with a homegrown marijuana plant. I live in the Garden State, where we are about to have legalized marijuana. It's good news for cannabis smokers, but a big question remains: Will legislators allow home cultivation? While the massive money and tax windfall of the retail cannabis market is assured, now regular consumers may still have to fight to have their own small gardens of green flowers. On December 7, a few dozen medical marijuana patients registered in N.J.'s extremely limited program gathered at the statehouse in Trenton to make the case that home cultivation should be allowed. Back in 2009 patients were supposed to be allowed to have six plants, but Assemblyman Herb Conaway (D., Burlington) led the Health, Human Services and Senior Citizens Committee to remove the provision at the last minute. When NJ's medical marijuana law was signed by outgoing Governor Jon Corzine in January 2010, it was the first compassionate-use bill in the country to completely eliminate gardens and force patients to buy from a small cartel of state-licensed dispensaries. 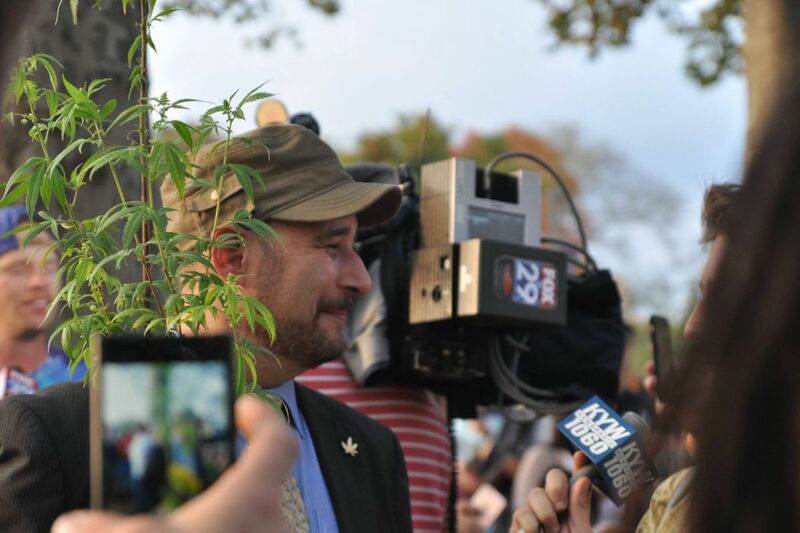 Peter Rosenfeld is registered in the program and volunteers with the Coalition for Medical Marijuana New Jersey (CMMNJ). He says that the state-licensed dispensaries are expensive. Patients report spending more than $10,000 each year for marijuana that costs $400 per ounce — plus a 7 percent sales tax. That level of investment into cannabis therapy is unachievable for most seriously ill residents, many of whom already live on a fixed income. Ken Wolski, a registered nurse and co-founder of CMMNJ, said that medical patients want the consistency and economy that comes with a home garden. "Home cultivation empowers patients to take charge of their own healthcare, to grow their own medicine for pennies and to choose the specific strains that best helps their medical conditions," said Wolski. Washington state allows medical patients to grow, but when voters approved full legalization with I-502 it only granted the right to buy for "adult use" consumers. Regulators in the Evergreen State are now asking legislators to revisit the issue. The legislatures in Maine and Massachusetts have delayed their voter-approved retail sales into next year and Washington, DC cannabis sales remain in a permanent legal purgatory. Yet, in all those areas, residents have the undisputed legal ability to sprout some seeds. High-end condominiums are even being constructed with built-in grow closets in DC and Boston. It's important to note, even with the freedom to grow not many average consumers roll up their sleeves and dig in. While the cannabis plant is remarkably hearty and will grow almost anywhere, getting a proper yield of flowers takes a bit of know-how. New York-based journalist Danny Danko has been the cultivation expert at High Times magazine for more than a decade. In the past, many of his readers were die-hard enthusiasts, but today Danko is seeing more interest from average consumers. "Nothing beats the joy of creating your own cannabis," he says enthusiastically. Will it cost thousands of dollars in equipment like buckets, lights, nutrients and books to nurture a few little marijuana plants? People can grow their own for a somewhat small investment. The only expensive items necessary are grow-lights and cooling/ventilation equipment and those are only necessary indoors. If you can grow tomatoes, you can grow marijuana. Pricey equipment isn't necessary. Is it better and/or more economical to grow in the sun versus under lights in your house? It's far more economical to grow outdoors but safer to grow indoors. A greenhouse is the best of both worlds, with the advantages of free sunshine outdoors and the ability to control the environment indoors. So you're utilizing the sun, but without the wind, rain, pests and dust that can attack outdoor plants. Can you set up a small garden in an apartment without setting the building on fire or making the entire floor smell like pot? Yes. A simple grow tent with a light, some fans, soil mix and buckets are all that's needed to grow. As for smell, an exhaust fan with an activated charcoal filter reduces odors substantially. Why is home grow needed after full marijuana legalization? I think home grow is very important. With all of the fears of "corporate cannabis" and the Marlboros and Monsantos (an agrochemical and agricultural biotechnology corporation) of the world getting involved in marijuana, the only way to keep them from taking over entirely is to allow people to grow their own. It's also the only way to truly know what went into your plants regarding pesticides, fungicides and nutrients and whether they're the strains that are right for you. Home grow puts a person in charge of their own destiny and keeps them from being at the mercy of licensed producers who may or may not have their best interests in mind.